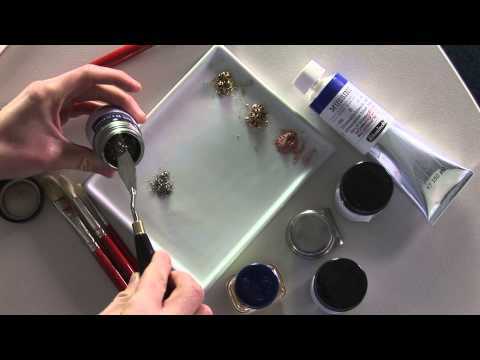 Genuine Artists´ Bronzes, Series 15, are formulated based on real metal pigments for painting techniques in oil, acrylic, water-colour/Gouache colours. 5 colours are available: rich gold, rich pale gold, pale gold, copper and silver. Schmincke Genuine Artists' Bronzes contain bronze or aluminium pigments. Therefore they are very light fast, more opaque and more brilliant than other metallic effect colours made of pearl lustre pigments. Only suitable for indoor objects! Ready to use acrylic colours, for special effects on acrylic pain- tings and other greesefree surfaces, such as paper, cardboard, wood, metal, plastic or gypsum. Handling: Apply undiluted with a brush on the surface of your choice. Can be diluted with water; dries wipe and water resistant. For glossy metal effects in Gouache- or water-colour paintings on less absorbent surfaces such as paper, cardboard, painting board or canvas (not suitable for gypsum, metal or plastic!). Handling: Mix required quantity of Aqua-Bronzes shortly before application with little water on a palette. Can further be diluted with water. The amount of added water influences the opacity and gloss of the colour. Iridescent metal effect on oil paintings or other pre-primed surfaces, such as wood, metal or gypsum; use only in combination with bronze medium (50032) - containing cumarone resin. When used on absorbent surfaces, we recommend an additional pre-treatment with turpentine substitute (50019) and thinned bronze medium. Handling: Mix 3 parts Oil-Bronze and 2 parts bronze medium with a painting knife - shortly before application. If requested, thin with e.g. turpentine substitute; dries wipe and water-resistant. Colour layers remain soluble to oil of turpentine (50102) or turpentine substitute after drying.